How Annie Jones attained fame as P.T. Barnum's "Bearded Lady," yet still died little more than a circus "freak" in the eyes of the business that chewed her up. 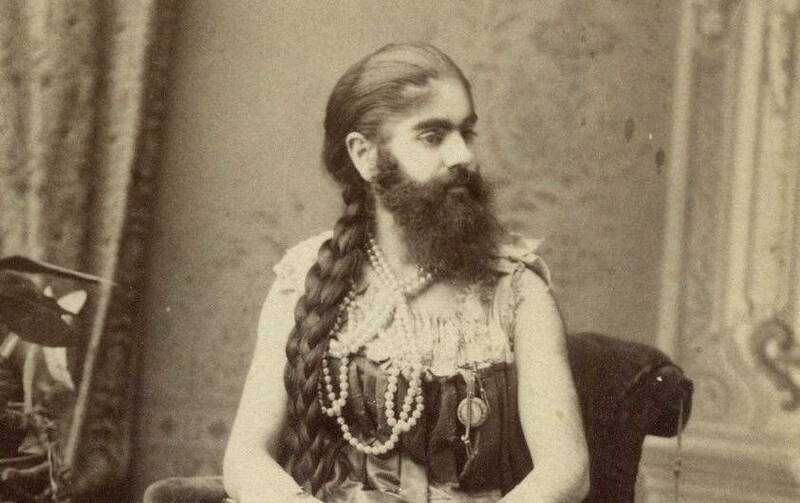 Bearded women have been a sideshow staple since time immemorial, often billed at the top of any list of circus “freaks.” And Annie Jones, the “Bearded Lady” of P.T. 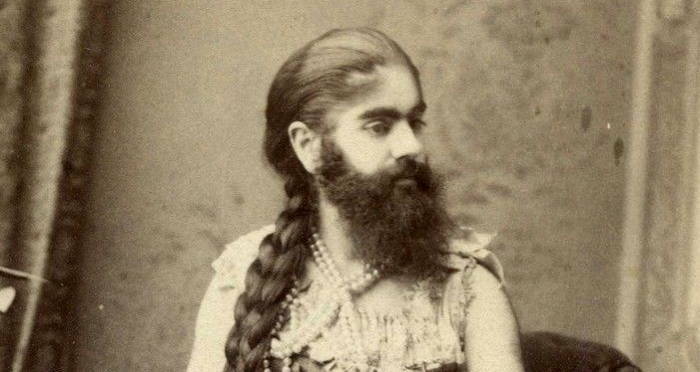 Barnum’s “Greatest Show on Earth,” was one of the most successful bearded ladies of all time. Yet that didn’t stop her life from being marked by tragedy. 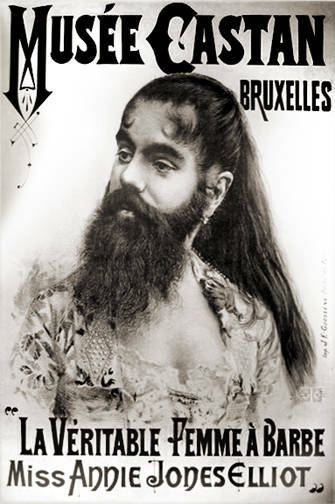 Wikimedia CommonsFrench poster advertising Annie Jones, “The Bearded Lady.” Circa 1880s-1890s. Annie Jones was born in Virginia in 1865, reportedly exiting her mother’s womb with her chin already covered in hair. Her parents’ initial shock at having an infant daughter with the facial hair of a full-grown man quickly faded after they realized that they had been presented with a unique money-making opportunity. Jones was not even a year old when her parents first pushed her into P.T. Barnum’s exhibition in New York City. The tiny girl was billed as “The Infant Esau,” a reference to the famously hairy brother of Jacob in the Old Testament. Furthermore, Jones was described as “the most marvelous specimen of hirsute development known since the days of Esau,” and thus began her career in show business before she could even walk. She was such a popular attraction that Barnum offered her mother a three-year contract at a rate of $150. Along the way, Jones appealed to audiences by playing up her womanly aspects in contrast to her facial hair, dressing in fashionable, feminine clothes and learning how to play the mandolin. The contrast worked, and Annie Jones proved to be one of Barnum’s most memorable acts. It is still unknown what exactly caused Annie Jones’ condition, although it was very likely hirsutism, a condition that causes “coarse hairs in females in a male-like distribution” and is estimated to affect around 5-10 percent of women. 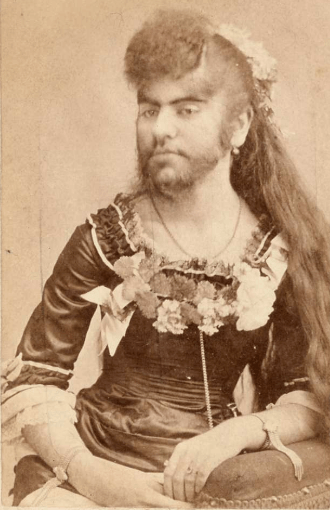 Indeed, although Jones may have been the most famous bearded lady of the era (thanks to her being part of Barnum’s extremely famous show), she was certainly not the only one. Julia Pastrana, born 1834, was a Mexican woman whose body was nearly entirely covered in thick, dark hair. Touted as “The Ape Woman,” Pastrana was another minor celebrity of the Victorian Age who toured Europe not only throughout her life, but as a mummified specimen after her death in 1860 as well. Like Pastrana, Annie Jones lived a short life, one that hardly gave her a chance to flourish outside of the sideshow tent. Jones did marry a man named Richard Elliot, a sideshow “barker” (the man who shouted at passerby in an attempt to lure them to see the attractions), in 1880. But because she was only 15 at the time, whereas he was a full-grown man, he concealed her age and her parents disapproved of the marriage. After this look at Annie Jones, the Bearded Lady, discover the stories of “Lobster Boy” Grady Stiles and the conjoined Hilton sisters.